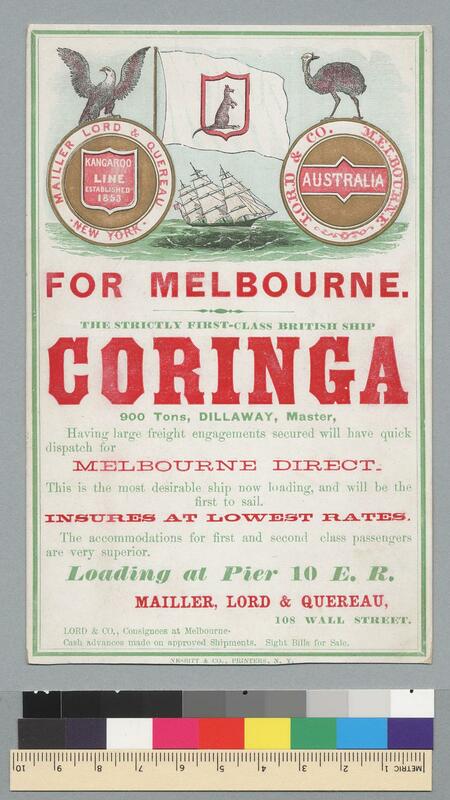 Kangaroo Line (Mailler, Lord & Quereau, New York) obviously sailing to Melbourne, from http://digitalassets.lib.berkeley.edu. 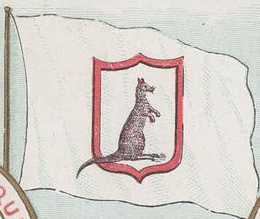 On a white flag a kangaroo is shown, apparently in natural colours, looking to the fly and standing in a red shield bordure, the tail hanging out - I like this touch! We learn that the line was established in 1853, moreover it is represented in the on-line Directory of Private Signals. Another mid 19th century firm, notable for represented both sides of the family of Theodore Roosevelt's wife Edith Kermit Carrow. Among other routes, Kermit and Carrow operated packets to and from Le Havre. The flag was a blue burgee with a red star. One of the few remaining significant companies operating under the U.S. flag. Keystone has long been one of the largest U.S. independent tank ship operators (i.e., not owned by one of the oil companies). Lloyd's Maritime Directory for 2001 lists 13 tankers under Keystone (11 active) for a total of 614,000 gross tons. The flag is rather nice (for a flag with lettering on it): yellow with blue stripes near the upper and lower edges and the monogram "CK" in blue on the center. The CK intertwined on the flag stands for Charles Kurz. CK was the founder of the company, and in fact it is still family owned and operated, now CKII and CKIII are present. The Great Lakes chart shows a larger monogram, also the blue is much lighter than shown above. Additional historical information is available at https://www.oceanconnect.com/PDFs/pressReleases/pr_Mar05_2003.pdf. The firm was founded in 1919, Chas. Kurz & Co. being an alternative name. According to http://www.cn.ca/specialized/great_lakes/en_KFGreatLakes.shtml, Keystone operates a Great Lakes Fleet. Keystone is part of Keystone Dedicated Logistics with seat at Carnegie, Penn. The Kingsland brothers operated the "Empire Line" between New York and Liverpool as well as the "Third Line" of New Orleans Packets from at least 1846. They had also become involved in the China trade by 1851. The Kingsland flag was quite distinctive, the field divided blue over white, with a white disk on the blue and a red one on the white. indicating dangerous cargo. The right menu leads to detailed descriptions of the company divisions’ activities: Atlantic and New York (both based at Staten Island), Hawaii (Honolulu), and Pacific (Seattle). The ‘Vessel’ department lists an impressive numbers of some eighty tugs and some eighty sixty barges, sixty of them double-hulled; see also the instructive gallery. Large logo on this page, “K-Sea” being a pun on the company president’s family name, Casey: https://vip.k-sea.com/login.php. Black name “K-Sea”, the initial large and “Sea” markedly smaller and raised, offering room for three waves: red, gold, and green; logo placed on a white background.